As I have said before, I am a huge believer in educational toys. My boys love them, and actually ask for them!! Learning Resources constantly comes out with new and exciting toys for the kids. 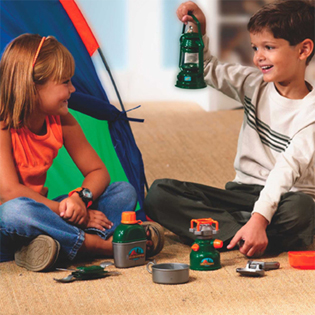 One of the toys that I fell in love with was the Pretend and Play Camp Set. We go camping at least once every year, and the boys love to cook marshmallows, sit in the tent and enjoy the lanterns!! Cooking tools, Lantern, Stove, Working Compass Watch and Canteen. If you are looking for some fun toy options for your kids, this is a great toy set to try out. I am very excited that the good folks at Learning Resources are giving one of you the same Camping set that I got. I know your kids will love it too. OOoh I hope I win. I would give it to my daughter who is in this huge pretend play kick! I'd give the set to my niece. Thanks. I would give this to my son...he loves camping! I would give this to my adorable little cousins. I would give this to my son because he LOVES Learning Resources toys! !